Discussion in 'Sports and News' started by printdust, Jul 8, 2011. Falls from outfield between the scoreboard and wall...and it doesn't look that bad. Hell, few except right there were paying it any attention. Even the A's announcers chuckle. The guy, like the guy who fell but did not die last year, was a fireman from out of town. His 6-year-old is standing next to him. God help that 6-year-old tonight. I also wonder about Josh Hamilton. He flips the ball to the guy. With all that Josh has been through, I hope this doesn't haunt him. The A's announcers kind of laugh it off....can't blame them because it really didn't look like a hard fall. Re: Fan dies from fall at Rangers game. The lesson in this is it's just a baseball. But in the moment, you're with your 6-year-old kid, making a road trip together and you see a chance at making a memory. Instead, you get a memory that will scar that kids' life. But how many of us would think about it in that moment? Damn, life is so precious. It would be tough. I'm glad I'm scared of heights and don't reach over railing and ledges. Hamilton was "distraught" after the game...as was A's reliever Brad Ziegler. I'd noticed the story earlier in the night, and the guy had been just hurt. I figured the guy would eventually be OK. What a sad story. I can't imagine being that little boy. He's going to have a fun day at the ballpark with his father, and this happens. And as an aside, I know this is a freak thing, but I'd hope that players who are going to give a fan a ball just trot over and hand it to them, rather than throw it in the stands. Years ago, I was at a game with my parents and we were sitting in the outfield. I had gone to the concession stand, and came back to find the shirtless guy sitting behind me with a red mark on his chest and a baseball. Joe Carter had chucked a ball up in the stands. My mother said it was a very frightening moment to see this baseball hurtling up at her. I understand wanting to be fan friendly and giving people a baseball. Just run over and hand it to a kid. Bet on this: The commissioner will mandate no thrown balls in to the stands. A bit of an overreaction I'd say. But as a player, you're just trying to dish it off and get back to the game. Having a huge trench that deep with a concrete bottom is just a recipe for disaster. Put a damn net over it. According to Baron's link, it wasn't the fall that killed him. It was a full-on cardiac arrest nearly an hour later. I'm guessing (I obviously don't know) it was brought on by the fall and all that. But he was conscious, telling people to watch out for his kid, and the relievers said he just had a splint on his arm. I raised the same question over in the baseball thread: Why the gap? To avoid fan interference? There used to be a rule on the books against throwing balls into the stands, and it's probably still there. And there's nothing wrong with it. It's gotten ridiculous over the past few years, where every warm-up ball and every last out ball has to be thrown into the stands. Just drop it on the mound and get on with it. 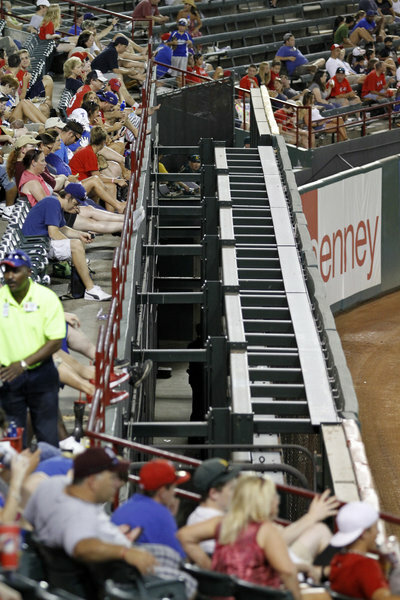 IIRC, the gap actually accommodates a working area - I believe the area covered by metal struts is scoreboard control or videoboard control, and the area behind that is a walkway that allows access to that control room and connects the bullpens and the grounds crew entrance.